Hip joints have a ball and socked structure, which means they can move 360 degrees. However, they are not equally mobile in all directions and often stiff muscles shorten the range of motion even more. In order for the hip joints to absorb the horse's movement, they need to stay in the position where they are able to move in any direction with ease. If riders put themselves in an incorrect position, their hips may reach the limit of their range of motion. In this case, they will not absorb the horse's movement correctly. There are two common mistakes that limit the hip joint movements. 1. An attempt to lengthen the stirrups. We can only move our leg backwards about 10 degrees. Anything more will include movement of the pelvis and spine. If we have tight hip flexor muscles we will not be able to create even these 10 degrees. When you sit in the saddle and try to lenghthen your stirrups in order to achieve nice long legs, you may extend your hip joint to the limit. Your legs will no longer be capable of moving backwards. If your flexor muscles are tight they will rotate your pelvis forward and put you on the crotch (Ouch!). 2. Legs rotated outwards. 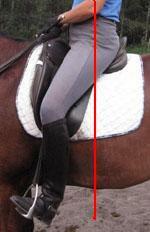 People very often rotate their thighs outwards when they are in the saddle. They look at sitting in the saddle as a relaxation and letting go. On the round horse, a relaxed leg naturally rotates out. The thighs rotated outwards limit the range of motion in our hips in the outward direction. If you stand up and try to rotate your whole leg (not just your foot) outward you will notice that it doesn't go far. On the horse, our legs spread apart and tight adductors (muscles on the inner thigh) will add to the stiffness. Locking the hip in this direction prevents backward movements of the pelvis. It also puts the adductors in a position where it is easy to grip the saddle, which will further lock your hip joints. The thighs are no longer flat on the saddle, the knees are not pointing forward, the toes turned away from the horse and if we have spurs on they will constantly hurt the horse. Click here for series of exercises to develop your hip flexibility. Irina Yastrebova, Riding Instructor and Trainer.